Desiree Rogers day of the Congressional picnic as she checks last minute details on her blackberry. Amiability and ability to get along and communicate with multiple departments and constituencies for each and every White House moment with scheduling changes at the last moment make it seem like juggling revving chainsaws, grisly if you miss, and any near misses or straight out flops are seen by everyone. Who can forget Queen Elizabeth being greeted at the White House for a state visit in the early 1990's with her voice heard from the podium, but only her magnificent hat could be seen as there were no steps for the rather tiny Queen of the British Empire to stand upon. The Social Secretary is responsible for ensuring that those sorts of details are clear. Gerald & Betty Ford had their own fun social gaffe when the president asked the Queen to dance and the Marine Corps band went straight into their repertoire of music from Rodgers & Hart, The Lady is a Tramp. Catchy. The blowback in the current administrations Social Office has been minimal so far. Desirée Rogers has handled many thing really well by virtue of her executive experience, education and foremost her relationship with the first lady. Innovation in White House entertainment is part of the Obama Charm with the Easter Egg Roll, picnic and the Governor's Ball. 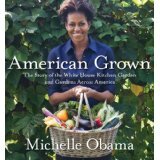 Desirée has had a jaw-dropping gaping hole in her judgment by even considering having herself photographed in Michelle Obama's Kitchen Garden wearing an Oscar de la Renta ball gown and needed a veto from the West Wing before the idea was fully dropped. As previously fretted about, Desirée Rogers penchant for publicity is a two-edged sword as the role is not at all about her - yet her self-stylized branding is about her being a cultural liaison (do the Obamas need a translator) before she has even put on a full state visit. 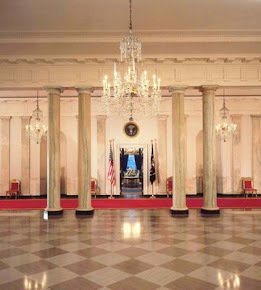 The ramifications of even thinking of a state dinner in this economic climate would be as loopy as even dreaming of having your picture taken wearing a high-end designer trench coat by Viktor & Rolf and Cartier earrings in the East Room and your not even the first lady. One of the toughest jobs for a Social Secretary had to be during the Carter presidency. Gretchen Householder Poston was the WH Social Secretary at an an intense time that saw a reduction in lavish entertainment by Mrs. Carter during a recession and a scaling back due to the Iran Hostage crisis. There was also an intense negotiation to get the Camp David Accords and the resulting event at the White House is now world history. Each one has had challenges, intrigues and time will tell how this works out for the Obama presidency. Most do not stay the full tenure of a president & first lady as the job is a tough, time consuming one that encompasses the needs of the West Wing with the changing demands of the East Wing. Hats off to all who have had the opportunity to serve in this capacity! Happy Birthday Mom! From both of us, NanaRh.